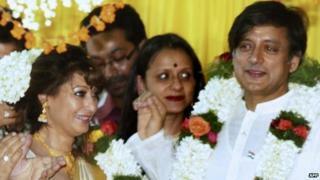 A magistrate in Delhi has ordered an investigation into the death of the wife of Indian minister Shashi Tharoor. Doctors said on Tuesday that Sunanda Pushkar, whose body was found in a hotel room on Friday, may have died from an overdose of drugs. The couple became embroiled in a row last week after Twitter messages suggested he was having an affair. Magistrate Sharma told the Indo-Asian News Service news agency that he had ordered the inquiry into Ms Pushkar's death after going through the findings of the autopsy report. "The post-mortem report reveals that she died due to [drug] poison. But it will be too early to say before her viscera report if she had consumed poison, or the drug consumed by her acted as poison," Mr Sharma said. Mr Sharma declined to reveal the full findings of the autopsy, but doctors have said that the "preliminary report shows there was drug overdose". The autopsy also found "injury marks" on Ms Pushkar's body, but did not say if they were linked to her death. Meanwhile, Ms Pushkar's son said his mother "was too strong to commit suicide". In a press statement released on Tuesday, Shiv Menon said media reports on his mother's death were "untrue and outrageous" and defended Mr Tharoor. "I also do not believe that Shashi was capable of physically harming her, let alone the speculation that he could have taken her life. They were very much in love, despite occasional differences, which they always overcame," he said. A public row broke out last week when seemingly private messages between Mr Tharoor and Pakistani journalist Mehr Tarar were published on his Twitter feed. Ms Pushkar, 52, said she had gone into her husband's account and published the messages, accusing Ms Tarar of stalking her husband - an allegation denied by the Pakistani journalist. Mr Tharoor, a former UN diplomat, was forced to resign from his first ministerial position in 2010 amid controversy over his involvement in bidding for a cricket team. He was appointed minister of state for human resource development in 2012.